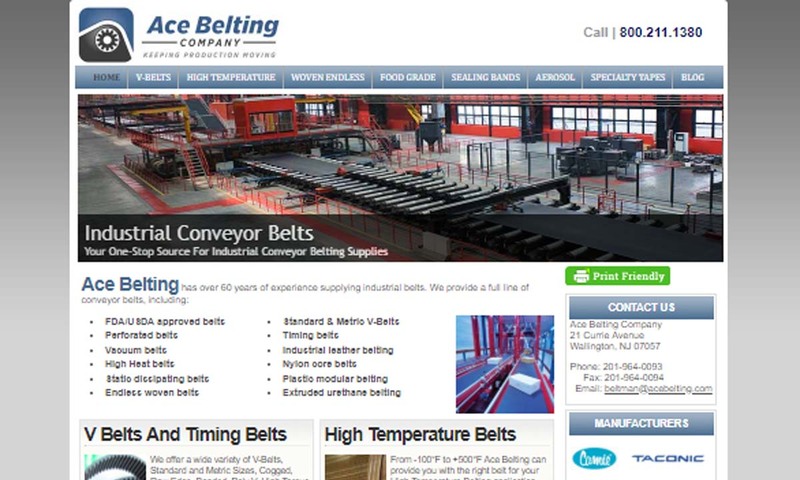 A reliable source for Conveyor Belting information and a resource for accessing leading Conveyor Belting and suppliers. Conveyor Belts Conveyor belts are flexible pieces of material used to move, or convey, items on a conveying system. Note that conveyor belts are not the same thing as machine belts. The primary difference between conveyor belts and machine belts is that machine belts are used to transmit energy while conveyor belts are used to transport goods. 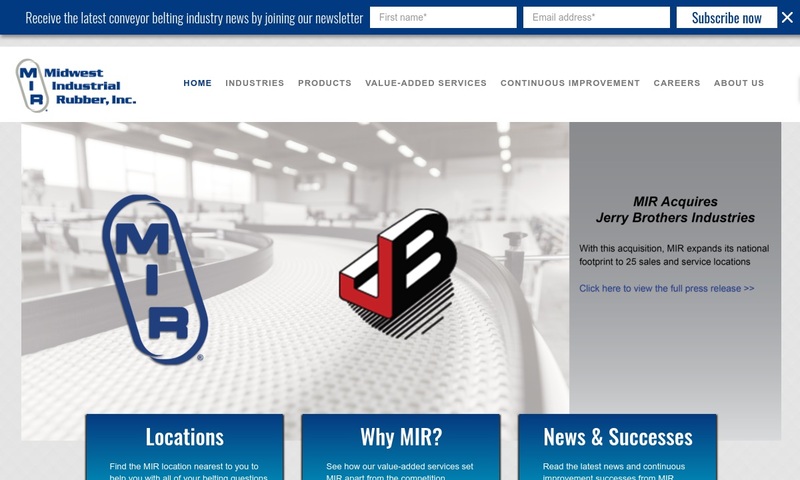 MIR is the premier specialty fabricator of light weight belting and conveyor accessories in North America. Offering dozens of materials and specialty conveyor products, MIR provides unsurpassed versatility and comprehensive customer service. 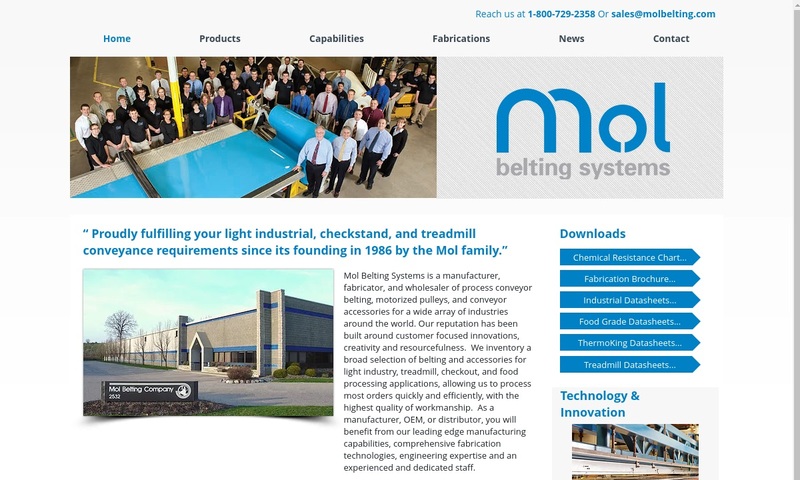 Mol Belting Systems manufactures conveyor belting for light industrial applications. Products include grocery checkout conveyor belts, ThermoKing Plastic Belting™, belts for treadmills plus yellow TrackSeal® safety edge. We are your premier source of all things pertaining to conveyor belts. 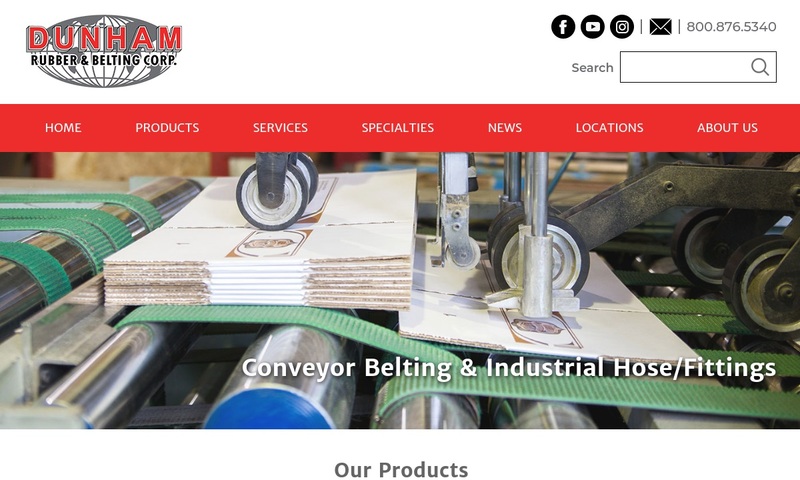 Our conveyor belts come ready to serve in many different industries including metal stamping, wood, material handling, paper converting and many other diverse industries. 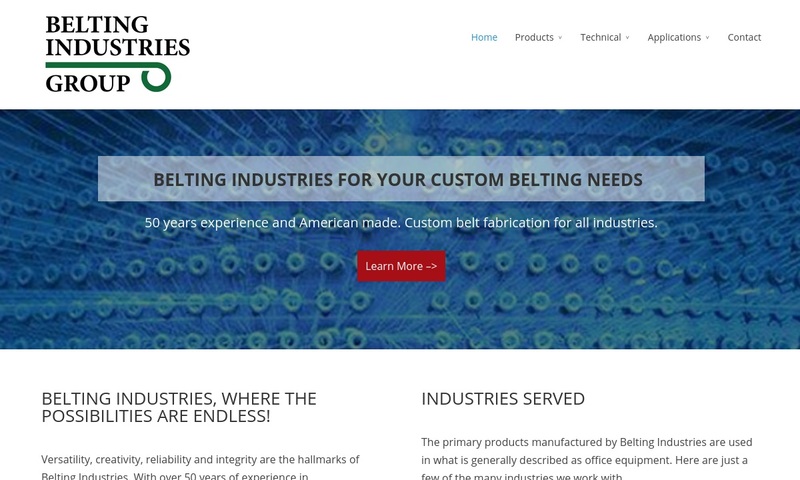 Belting Industries Group has been manufacturing conveyor belts for over 50 years. We manufacture woven endless, stretch, round, foam, metal, high temperature, film, and covered belts. Conveyor belt systems are essential for continuous transport of items from one area to another in many commercial and industrial facilities. There, they can help to significantly reduce production times and reduce overall labor costs. Factory assembly lines, for example, always use conveyor belts to help make the process more efficient. Even small retail stores have conveyor belts at their checkouts to keep goods moving before and after they have been scanned. In fact, almost every industry makes use of conveyor belting. Some examples of these industries include food and beverage processing, pharmaceuticals, waste management, milling, mail sorting, and printing. Conveyor belting is also common in several types of engines. Without conveyor technology, facilities in these and other industries would never be able to operate as efficiently as they do. Manual labor would be required to move and sort goods, which would be very time consuming. Manufacturers first began using conveyor belt systems at the tail-end of the 1700s. The first one that we know of was introduced to the world in 1795. It was made up of a wooden slider bed, a leather conveying belt, pulleys, and a hand crank. Seamen and merchants used it to load products and goods onto ships. Soon afterwards, in 1804, the British Navy commissioned the invention of a steam powered conveyor, with which their cooks could efficiently make biscuits. After this, the use of conveyors lapsed for some time. It picked up again in the late 1800s, spurred on by the requirements of miners and the burgeoning automotive industry. First, in 1892, American inventor Thomas Robins designed a conveyor belt at the behest of Thomas Edison. Edison wished to have an efficient way to cart coal and ore from the coal mines run by his company, Edison Ore-Milling Company. Robin’s solution was a leather belt with pieces sewn together with wire. His invention proved successful, and it took first prize at both the Saint Louis Exposition and Pan-American Exposition. It also took the grand prize at the 1900 Paris Exposition. Next, in 1901, a Swedish company called Sandvik developed a steel conveyor with which they could convey gravel. In 1905, an Irish miner turned engineer named Richard Sutcliffe invented the very first underground conveyor. This conveyor changed mining significantly, as it drastically cut down on the labor required to get materials from the mine to aboveground. Just three years later, engineers invented the roller conveyor. Little changed with conveyor belts for many years, until 1957, when B.F. Goodrich invented and patented a rubberized steel belt with a longer service life than any conveyor belt before it. It was set apart from others by taking a half twist that, by exposing both sides of the surface area, cut the exposure to each in half. Over time, as scientists created stronger materials, Goodrich engineers came up with even more durable belt products that did not require the twists. An American company called Intralox patented the first plastic conveyor belts in 1970. Since then, many other companies have gotten in on the plastic belt. Today, conveyor belts are available in a wide range of rubber materials and polymer materials. They are capable of functioning in countless environments. Generally, conveyor belts are flat and made from an elastic material like rubber. To work, they are most often mounted on a series of rollers that are powered by an electric motor. A typical flat belt has two or more layers for added durability and wear resistance. The core material is a fabric or wire mesh. Common examples include aramid fiber, polyester, cotton, steel, stainless steel, or galvanized steel. This core is coated in layers on either side of the mesh. Manufacturers can make these layers using a variety of materials, as long as the chosen material is durable, strong, and capable of operating without interruption. The material may also either be flexible and completely seamless or made up of a series of hard but light pieces. Manufacturers most commonly select rubber as a belt material, but they often also choose a plastic like PVC, or polyurethane. When designing conveyor belts, manufacturers consider application factors such as the products or materials you wish to transport, the weight and shape of those objects, the length of your conveying system, the presence of any existing equipment into which you need to integrate your conveyor belt, the layout of your space, the environment of your space, how often you plan to run your conveyor belt and the standard requirements of your system (FDA, medical grade, food grade, etc.). Based on these factors, manufacturers can make a lot of decisions, including materials, belt type, belt size, belt groove shapes and belt construction. 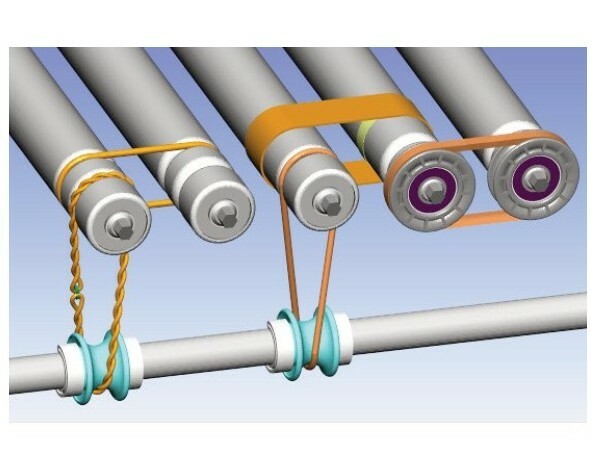 For example, if a conveyor will exist in a space where it needs to work against gravity, manufacturers can design a belt with ridges in it to keep objects from rolling off while they are moving. Or, for heavy loads, they can design a wider belt. Flat belts are linear belts that operate continuously. They are the most common type of conveyor belt. As such, they are used for a wide variety of applications, such as industrial coating, draining, heating, cooling, drying, mining, and logging. Continuous belting is belting that has neither seams nor joints. For this reason, it is sometimes referred to as “endless belting”. O-ring belts, also known as round belts or endless round belts, are stretchy belts with a few different applications. Often, customers use them to keep flat belts firmly on their rollers or connected to chains, instead of slipping inward during motion. This is mostly a risk at curves or turns in large conveyor systems. Also, customers frequently purchase o-ring belts for use in power transmission systems. Cotton conveyor belts are lightweight, tightly woven belts made from cotton. They are best for use in food processing and baking. Manufacturers can design them to comply with FDA/USDA standards. Timing belts are used in internal combustion engines and works in tandem with the engine’s gears and cogs. Many manufacturing facilities accept custom orders for belts that are being designed for a specific function or piece of equipment. Fin belts are named for their fin-like components, which stick out from the main belt. These fins are made to flex and pick up quickly moving containers. These are used to separate cartons in packaging facilities. Wire belts are not made with a rubber or polymer belt, but rather woven wire cords (usually steel or stainless steel cords) or chain mail-esque wire links. Wire belts are used for heavy duty applications. V-belts are belts that feature a v-shaped groove and run in a pulley. They transit higher torque than flat belts but require less width and lower tension to do so. For added traction, manufacturers can deepen the V slot. V-belts are best with lightweight applications. Rubber conveyor belts are all conveyor belts made from natural or synthetic rubber materials, such as urethane, silicone or neoprene. Rubber belts are as versatile as rubber itself, so they are available in a wide range of thicknesses and grades. They can be used for anything from food conveying to industrial conveying. Roller conveyors are conveyor systems that run using a set of rollers installed inside a frame. In this case, the belt sits on top of the rollers. When the rollers rotate, the belt moves forward and takes the goods it is conveying with it. Conveyor belts are available with a wide range of accessory products for a wide range of applications. Common conveyor system accessories include conveyor belt fasteners, belt lacing strips, clipper lacing, hooks, plate grips, and installation tools. The first step in caring for your conveyor belt has to do with how you use it. Basically, only use your conveyor belt within its designed limits. Do not put loads on it that exceed its weight capacity, and do not place substances on it that are not compatible with your belt material. In addition to this, you need to regularly inspect your belt, keeping an eye out for contaminants like dirt and dust, as well as wearing and tearing and improper belting adjustment. Belting that is out of alignment is at risk of ripping, twisting and slipping. If you allow it to move loads while misaligned, your belting can easily become loose or stretched. This will lead to diminished quality, inefficiency, and risk of accidents and injury. You also need to make sure your belt is properly tensioned. Proper lubrication is another way to make sure your conveyor belt works well and lasts for a long time. Lubrication will not only keep its constantly moving parts from abrading but will also stop contaminants from getting too close to their surfaces. Still, contaminants can be disruptive even if they don’t make it onto the surface of the conveyor parts. So, we recommend you also employ an air quality maintenance system or a dust collection system. The quality standards to which your conveyor belts must adhere depend on your application, industry, and location. For example, if you are conveying food, your conveyor belt must be food-grade/FDA compliant. Likewise, if you are transporting agricultural material, your belt must be USDA compliant. To find out the standards you need to request for your particular belting, talk to your industry leaders. There are many manufacturers out there that offer custom conveyor belts and standard conveyor belts, as well as discounted surplus conveyor belts, and used conveyor belts. What option is best for you depends entirely on your application and budget. 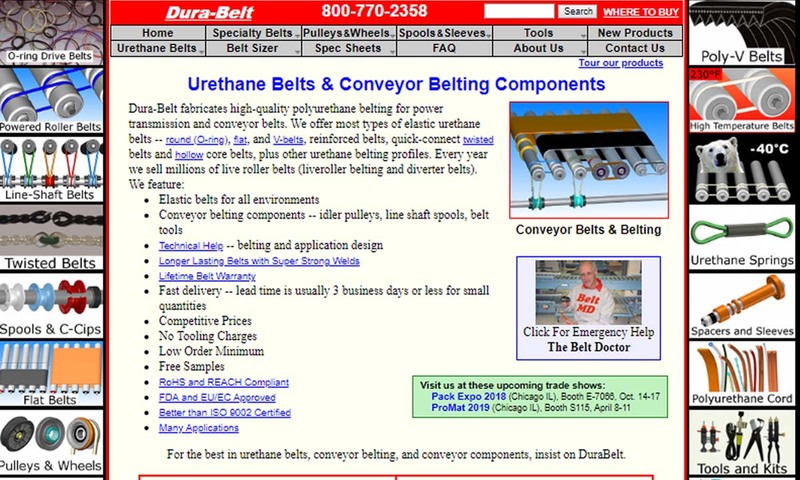 To help you along the way, we’ve listed several high-quality conveyor belt manufacturers and suppliers on this page. Find out what they offer by browsing their profiles and/or websites. To focus your search, we recommend you take some time to jot down your specifications, requirements, and questions.  Don’t forget to include things like your budget, your quality standard requirements, your delivery deadline, and your support preferences (installation assistance, parts replacement, etc.). Once you’ve got your list together, get to looking. All of those manufacturers we’ve listed are experienced and trustworthy, but only one will be right for you. Find out which one that is by picking out three or four and reach out to each of them with your list. After you’ve spoken to each of them at length, compare and contrast their services and offers, and select the one that suits you best.